Click on image to enlarge it, and mouse over text to find links in the text in this column and below. You may use this image without prior permission for any scholarly or educational purpose as long as you (1) credit the photographer and (2) link your document to this URL in a web document or cite the Victorian Web in a print one. In his Sonnet III he writes: "I thank thee Gracious God! That I do feel upon my cheek the glow of indignation, when beneath the rod a sable brother writhes in silent woe." But Southey’s political thought underwent a gradual transition after witnessing the confusion and horrors of revolution and the Peninsular War. His critics, amongst them Lord Byron, ascribed this change to his being co-opted by the Establishment as Poet Laureate in 1813. In 1817 a journalist quipped that Southey had been “a gentleman of credit and renown, and, until he became Poet Laureate, a Poet.” For the rest of his life Southey was a resolute Tory who devoted much of his historical prose to the great heroes of the age, such as Horatio Nelson. Southey was one of the best known of the Lake Poets, along with William Wordsworth and Samuel Taylor Coleridge. They all lived in the English Lake District at the turn of the nineteenth century and are considered part of the Romantic Movement. Southey died from the effects of a fever on 21st March 1843. He was buried in Crosthwaite churchyard near Keswick. 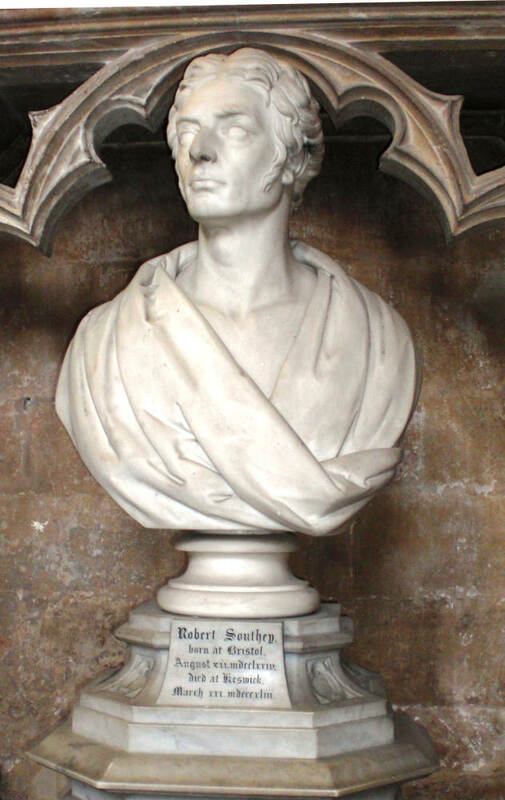 In addition to this bust in Bristol, Southey is also commemorated by a bust in Poets Corner at Westminster Abbey and a full length recumbent effigy by John Graham Lough in Crosthwaite in the English Lake District. Baily was also from the Bristol area and there are a number of his sculptures in Bristol Cathedral, in the Masonic Hall and elsewhere in the city. He is perhaps most famous for his sculpture on Nelson’s Column in London's Trafalgar Square. Heinowitz, Rebecca Cole. “Robert Southey.” The Oxford Encyclopaedia of British Literature. Oxford: Oxford University Press, 2006. I, 47-51.